The Munro log for Jan and I is now on the web site. It will allow you to see the details of all the individual walks that collectively added up to us completing the 277 Munro’s in Munro’s Tables. When we started in 1984 there were 276 but the Ordnance Survey added one more when they resurveyed the mountains around Laggan a couple of years later. Then, although we formally finished in 1996 the official table was updated again by the SMC (on a whim?) the following year giving a new total of 284 (1 deleted and 8 added). Some we had already walked, leaving just 5 for us to go back and complete. It actually gave us one of my favourite walks. Angels Peak (Sgor an Lochain Uaine) in the Cairngorms was a new Munro and it’s miles from anywhere. Our friend Kay from Inverness dropped us off, with her husband Mike Whittall, in Glen Feshie. Then we walked over the Moine Mor high plateau on a bright, dry day in June. We went across to Angel’s Peak first and around the enormous corrie north to Braeriach, on to the Lairig Ghru which we followed down to the Rothiemurchas Forest where we cut across to the road at Loch Morlich and Kay was patiently waiting for the 3 of us. A fantastic day on some of biggest mountains in the UK! 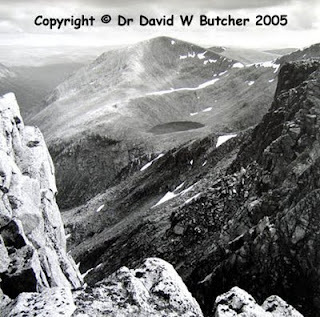 The image above was taken from Braeriach looking back to Cairn Toul, Angel’s Peak is on the right just out of shot above the small lochan in the image. It is reached through the Trip Logs link in the Info Box.